Maybe you are wondering how is this mom even qualified to tell me about sensory play? Well let me tell you the short version by giving you some information about my background before becoming a mommy. I was a special education teacher with a degree in Birth Through Five Education. Before that I was working/playing with children with numerous abilities and needs. Actually, I even created my own form of play therapy for children with Autism of whom I worked with one on one. Play is very important and with the right type of structure and scaffolding you can really teach your little one a lot. I always worked on social skills, appropriate play, imaginative play and language skills during play sessions. Through play you can introduce so many new things and explore educational concepts such as big/small, floating/sinking or even explore simple things such as color or shape. I wanted to share with you how to utilize something as simple as “play dough” and make it an educational and sensory filled experience. We chose ZDough as our first experience with play dough because it is made with household ingredients. What exactly? ZDough is filled with food-grade ingredients such as flour, water, salt, cream of tartar, oil, food coloring, essential oils, baking flavors, and spices. This is important to me because I want Izzy to have this sensory experience however if she sneaks a taste, which she did, I don’t want to worry about calling poison control. ZDough comes in adorable little tins and all of the colors are scented. We chose Blueberry, Orchard Apple and Lavender. First I let Izzy feel the ZDough, she was pinching off little pieces and exploring this new feeling. I talked about the colors of our dough while she explored the feeling and then we smelled it. Next I added in some cookie cutters so she could see what shapes and animals we can make with the dough just by pushing on it. Her favorite part of this was pulling the animals out. We talked about the animals. I repeated the animal names to her and make the sound as we pushed on the cookie cutters. Then I added some tools from the kitchen like a plastic fork and a potato masher so she could explore what her tools could do to the dough. As we cleaned up Izzy snuck a taste which she wasn’t thrilled about the flavor so I don’t think we will have to experience that again. But in all she was able to have a 4 senses experience of this new activity. 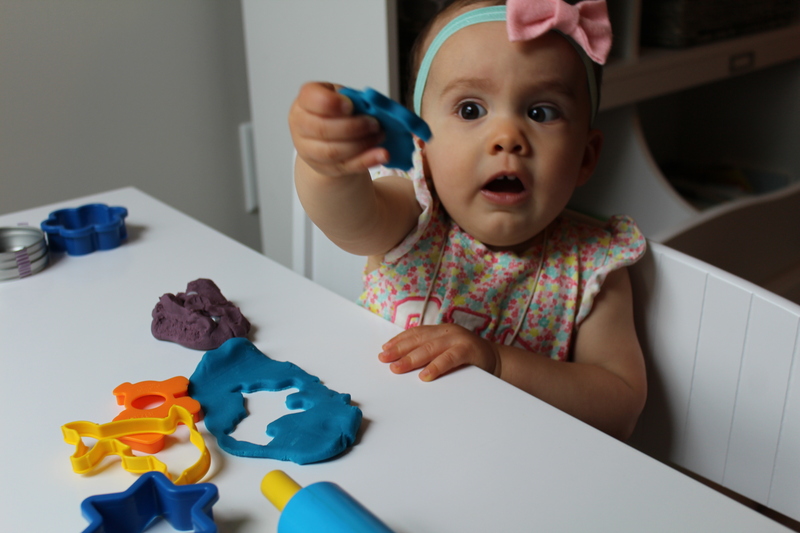 ZDough made a fun play dough first for Izzy! If you want to try ZDough with your little you can find them on Instagram and Z-Dough.com. For more fun ways to explore and play with ZDough I highly recommend you visit their Instagram. Looks like she had a great time! I’ve been hesitating to try anything like this because my little guy was very into exploring with his mouth 😉 but I think we’re finally moving past that. This sounds like a great product! Ugh playdough. I wish my girls would play without eating. There are so many creative things to do with it, but alas, ours sits on the shelf. But yay! for you and Izzy-looks like she enjoyed it! Ooh now that is a good idea. Something my silly boy can play with and isn’t gonna hurt him if he eats it – because lets face it, he eats everything, except real food. We are all about learning through play around our house as well. They spend most of their time outside with sticks and dirt, but playdough is one of their favorite indoor sensory activities. You are most definitely qualified to teach us about sensory play! It looks like she had a great time! I’m going to check out ZDough now. I think Parker is ready for this!